The Northern California Cherry Blossom Festival is extremely fortunate to receive the support and guidance from numerous community members since 1968 when the Festival began. The Organizing Committee is truly grateful to these pioneers for sharing their passion with our community for more than 50 years! This page will feature biographies of these volunteer leaders who have been with us from the very beginning. This year, the following three Ikebana teachers will be recognized in the Grand Parade. We will continue to add profiles of members who have supported us from the Festival’s inception. Kayoko Suiyo Fujimoto began her initial study of Ikebana as a high school student in Osaka, and moved on to study in earnest in 1948 at the Ohara School of Ikebana in Tokyo. In 1953 she received Japan’s Official Ministry of Education Certificate judged by the Headmasters of the major schools after passing Ikebana examinations of extensive scope. 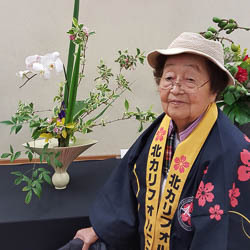 She has received induction into the Bunka Hall of Fame in San Francisco as well as Honorary Lifetime Member of the Ohara School in Kobe, Japan. In 2010 she was bestowed The Order of the Rising Sun, Golden and Silver Rays, “Kyoku Jitsu Sou Kou Sho,” by the Emperor of Japan for her many years of service to Ikebana and promoting the traditional culture of Japan. The Jodo Shinshu Honpa Hongwanji has awarded her the Cultural Bridge Between the USA and Japan recognition. Kayoko Suiyo Fujimoto has attained the title of Grandmaster within the Ohara Ikebana School, and continues to teach to this day. Kinko Kinsui Saiki was born in Chiba Prefecture, Japan, and began studying Ikenobo Ikebana as a young child. In 1958, the Saiki family moved to Stockton, California, and later relocated to San Francisco, where she continued to further her Ikenobo Ikebana studies with her teacher, Mizuki Sensei. She later took over the classes when Mizuki Sensei retired. At regular intervals, Kinko Kinsui Saiki returned to Tokyo and Kyoto to take several courses at the Ikenobo Headquarters. She holds the degree, Karoho, the highest degree in Northern California. While active, she assisted in the Bay Area, teaching and demonstrating for Adult Education and at the Macy’s Department Store and Cultural and Art Festivals. 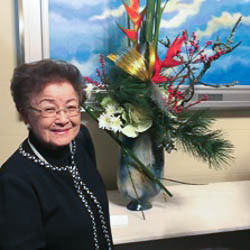 She has served as a board member of Ikebana International Society of Northern California, Ikebana International, and the Ikebana Teachers Federation. Kinko Kinsu Saiki has been with the Northern California Cherry Blossom Festival since its beginning in 1968. Joan Yusui Suzuki was born in San Francisco and moved to Japan at the age of five. She began studying Sogetsu Ikebana in Tokyo and received her first teaching Certificate when she was 16. Returning to the USA as as a student, she began to teach Sogetsu Ikebana while assisting her mother, Shunei Uchida, who introduced Sogetsu to San Francisco. 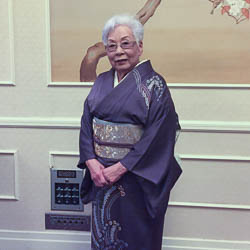 Joan Yusui Suzuki has received many awards and honors including the ‘Model Teacher’s Award’ in 1968; Sogetsu Headmaster Sofu Teshigahara conferred title of ‘Riji,’ highest rank in Sogetsu, in 1973; Sofu Award in 1978; awards from the Headmasters in 1997 and 2007; and most recently, a Commendation from the Consul General of Japan, Jun Yamada. Joan Yusui Suzuki is a charter member of Ikebana International, a past president, and charter member of Ikebana Teachers Federation. She has participated the Northern California Cherry Blossom since its beginning in 1968.